As you can see, the episodes are quite varied and diverse, although the most impressive episodes for me include "Cartoon Wars" and "Ginger Kids". Cartoon Wars is a classic, especially the evil little furry animals who do some outrageous things that we cannot mention here. Ginger Kids is great as well as Eric attempts to turn the world against those with red hair, however it backfires and Eric becomes a beacon of hope for these ginger kids. Of course, the tourette's episode is priceless... okay, all the episodes rock and are extremely funny and had me in tears and many occasions. Deliciously funny and addictively entertaining. Eric Cartman, you may not be real but your creators have truly made you into one of the world's most liked and disliked fictional characters. Decent video and audio quality, this collection comes in an almost Bible-like packaging that only cements your purchase even more. 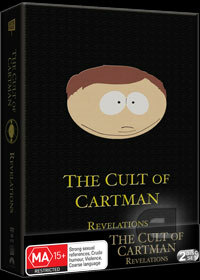 Recommended to lovers of South Park or Eric Cartman!